Yamaha NMax 150cc scooter is rumoured to launch in India. It will be a maxi-scooter and will rival the likes of Aprilia SR150 and Vespa SXL 150. As of now, there are only two 150cc scooters in India. Yamaha currently has no 125cc scooters in India. It has 5 scooters in its kitty, but all of them are 110cc ones. On the other hand, the 125cc segment is rising rapidly in India. As the 125cc segment scooters offer more power as well as more features. So, for daily commutes on the highway, people are preferring this over 110cc ones. Looks like Yamaha is skipping the 125cc segment and directly taking on the 150cc department. Reports say that Yamaha NMax 150cc scooter might debut in India in 2019. Yamaha NMax is basically a maxi-styled scooter. Examples of maxi-styled scooters in India include Burgman Street and now defunct, Kinetic Blaze. Technically, Burgman Street is not a proper maxi-scooter. Its design is inspired by the globally popular Burgman maxi-scooter. Maxi-scooters are styled very unusually. They get a disproportionate looking body, with a larger front portion and comparatively smaller rear portion. The handlebars are placed on the front apron, instead of the normal design. They offer immense comfort and are primarily meant for long touring. 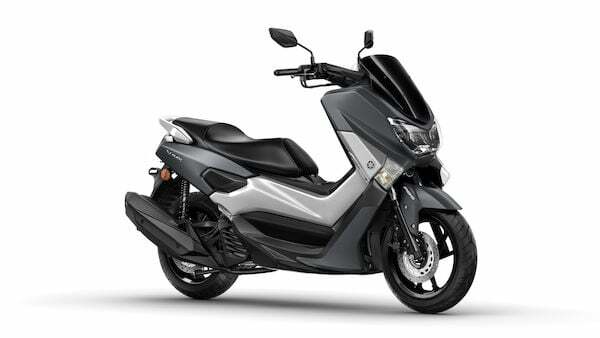 In the front, Yamaha NMax gets a rather large front apron with an attached headlamp as well as a windscreen. The handlebars are placed on the front apron, because of which the headlamps do not turn with the handle. The scooters in India get a hollow space between the seat and the handle, which is much lesser in maxi-scooters. The body panels come up almost till the seat and the footpegs are beside the panel, like a typical cruiser. The seat of maxi-scooters is generally huge, which will the same case for NMax as well. Besides, it also gets a sporty exhaust muffler. Reports say that the Yamaha NMax will use R15 V3’s 155cc liquid cooled engine. The power figures won’t be the same as the R15, obviously. Globally, its 155cc engine produces 14 BHP and 14.4 Nm of peak torque. The figures are much higher than that of SR150, which puts out 10.4 BHP and 11.4 Nm. However, for fuel efficiency, the scooter might get a retuned engine. Yamaha NMax will offer a plethora of latest features, including a fully digital speedometer, ABS, front disc brakes, LED headlamps and LED tail lamps. The digital speedometer might get connected to Bluetooth for GPS navigation, call alert and notifications and advanced telematics. This feature comes in the TVS Ntorq 125. As of now, no further details are known. If the Yamaha NMax is launching in India, we expect it to cost around Rs 80,000-90,000, easily. If it retains the global bodywork for the Indian market, then it would pull off as a touring scooter.